It was an impressive debut for OG Anunoby on Thursday. The Raptors’ first round pick played his first NBA game, tallying nine points, three rebounds, and two assists in 17 minutes of action off the bench. The 20-year-old forward was also a team-high +26. But as good as he looked because of his play, it was how the 6-foot-8 forward looked in his Raptors uniform that had a lot of people talking. Basketball shorts have seemingly been gaining in length for years now, but Anunoby dances to the beat of his own drum. OG took us back to another time, as it looked like he borrowed a pair of John Stockton’s old shorts for the game. “I don’t care if he wears a bikini as long as he plays hard,” head coach Dwane Casey said of Anunoby, who also wore short shorts in college at Indiana. 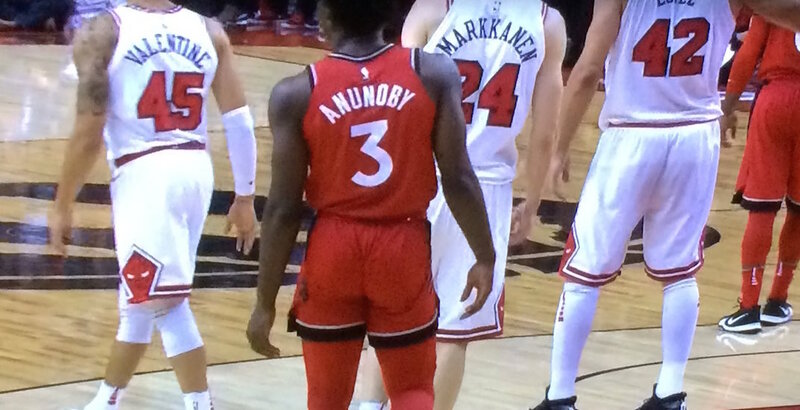 Mr. Anunoby does indeed wear short shorts. Hey OG Anunoby, Richard Simmons called. He wants his shorts back.